I hope you had a wonderful weekend. Ours was pretty great. We got ready for our trip, hung out with some friends, and watched Dr. Who. Today I want to talk about our trip we took to Tokyo Disney. When we were looking into moving to Korea we also looked at nearby places that we would be able to travel to. When I saw Tokyo had a Disneyland- I knew we needed to take a trip. I mean it's Tokyo Disney! Matt and I aren't huge Disney crazies, but I couldn't resist. We flew into Tokyo for a three day weekend and spent 2 days at the park. Our last day was spent in the city exploring around. Originally we were going to spend Friday and Sunday exploring the city and just take Saturday for the park, but it was raining and didn't feel like wandering around Tokyo. We also heard the park would be super busy on Saturday and to try to visit on a weekend. So we opted to spend Friday and Saturday at the park. This worked out perfectly for us. Friday was rainy so the crowds were super low. We were able to ride all the rides we wanted and didn't wait in any lines, and we got to the park around 3:00. Even though Saturday was rainy as well, the park was packed. We only rode a couple of rides, and spent the day eating around the park. I want to spend another post or so talking about the food and the rides, but for now here's some helpful information. Tokyo Disneyland is a full size park and I would recommend spending 2 days at the park. There is also Disney Sea that I heard was pretty cool, so maybe another 2 days there. But if you go on a weekday during the low season- I think 1 day at each park would be fine. This is if you're into Disney and theme parks- if not, skip it. Also, if you just have a few days to visit Tokyo- I wouldn't make a trip to Disney. There's so much to do in Tokyo first before going to Disney. That's just my opinion though. Don't let the rain stop you. It was raining both days we were there, and it really wasn't that bad. 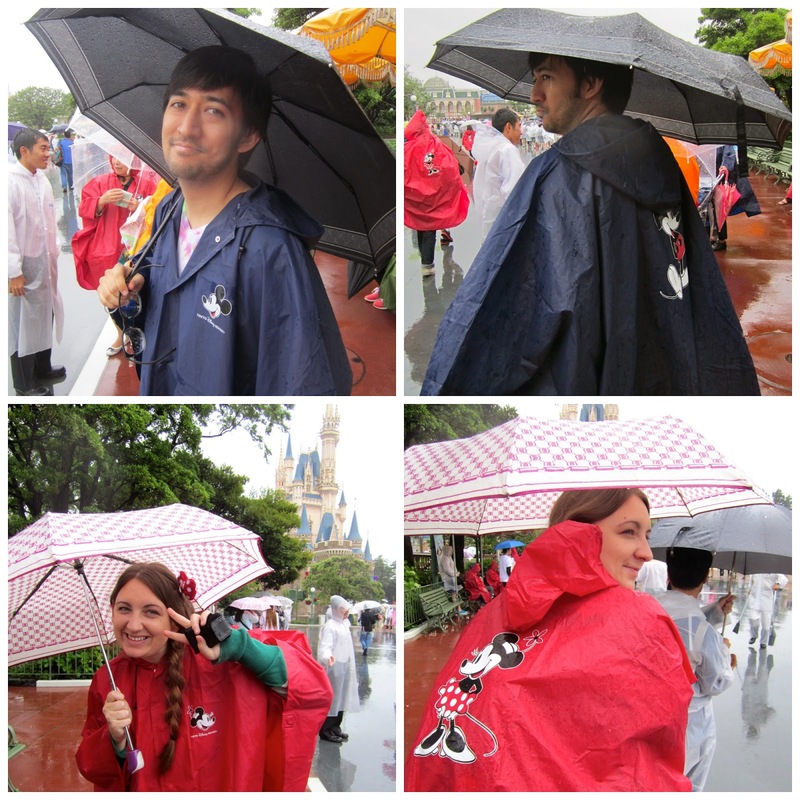 We bought our $12 Mickey and Minnie ponchos- grabbed our umbrellas- and hit the park. At the end of the first day we were soaked, but we had a blast. The rain also keeps the numbers down, so the park is a bit more fun. Our pictures weren't as great, but really- who cares!?! In terms of getting to the park- it's super easy. We arrived at the Tokyo Narita airport- hopped on a bus and within an hour and a half we were there. You can also take the JR train and get there as well. The bus will take you to any stop within the park complex (hotels, welcome center, parks, etc). For more information click here. Once you're in the park, there is the park monorail and buses for you to use. You can get a two day pass for about 800 Yen. There are many hotels for you to chose from. There are Disney hotels, Disney Resort official hotels, Resort partner hotels, and Resort good neighbor hotels. The first two are within the park complex and really easy to get to and from the parks. We stayed at the Sheraton Grande Tokyo Bay Hotel which was one of the official hotels. It was really nice and had a great view of the two parks. The best part about staying at one of these hotels are the benefits. The first three sell park tickets which is a huge benefit. During high season tickets can run out, but if you are staying at the first two hotels you are guaranteed tickets. For more information about the hotels and the benefits click here. And I think that's about it for now. I'll talk more about rides and food later. I will say this was one of our most favorite trips we've taken. It was so much fun to run around like kids and visit Disney. I love your rain ponchos! Thanks! We loved them. It was the best purchase of our trip. The only downside was everyone had them, so if we split up it was hard to spot each other. I love how every Disney park is different, but you can just tell it's Disney because of those special touches. I went to Disneyland Paris over the summer and it was a great experience. OOOO- I would love to go to Paris Disney! I loved seeing how special Tokyo Disney was.